Florida and the UAA have teamed up to start the 'One American Appeal' fund to help Hurricane Irma victims. 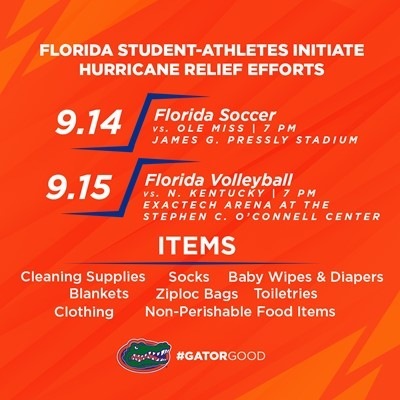 GAINESVILLE, Fla. — The University of Florida and University Athletic Association have teamed up and asked everyone who is able to donate to https://www.oneamericaappeal.org/. The "One America Appeal" launched last week is now expanded to include the Florida Disaster Fund, the state's official, private fund established to assist local communities. A donation to "One America Appeal" will help Florida residents impacted by Hurricane Irma. The fund was established through former President George H.W. Bush's library and foundation to aid response to Hurricane Harvey, which resulted in massive flooding in the Houston area. Former Presidents Barack Obama, George W. Bush, Bill Clinton and Jimmy Carter have joined Bush in this initiative. Florida Gov. Rick Scott activated the second fund, which is part of One America Appeal. "One hundred percent of funds donated to the Florida Disaster Fund will go toward disaster-related response and recovery because the fund has no overhead costs," Sunday's announcement stated. More information can be found on social media using the hashtag #OneAmericaAppeal. Fans wanting to donate items can do so at Thursday's soccer match and Friday's volleyball match. Florida Athletic Director Scott Stricklin and other UAA coaches and officials have teamed with the city of Gainesville to host a breakfast on Friday morning for responders within the community who have worked tirelessly following Hurricane Irma. The UAA is working on recognition for the thousands of responders who have aided the community, the state of Florida and beyond during Hurricane Irma. In addition, Gator sponsors have provided tickets that will be donated to evacuees and various hurricane responders. To help recognize the plight of the thousands of families impacted by Hurricane Irma, the Florida football team will wear a special helmet decal when the Gators take on Tennessee in their home opener on Saturday. The UAA & @UF have teamed up with #OneAmericaAppeal for #HurricaneIrmaRelief donations. Hundreds of UF student-athletes' families and friends were directly affected by Hurricane Irma. The helmet decal is designed to honor those affected by the storm and all those who responded and volunteered their time to help evacuees and victims.